Mysore Pak is Known as the king of sweets and it is a very popular south Indian sweet made during special occasions. Already I tried Coconut Mysore Pak and DatesMysorepak My daughter always brought me Krishna sweet Mysore pak from Chennai in her official visit. 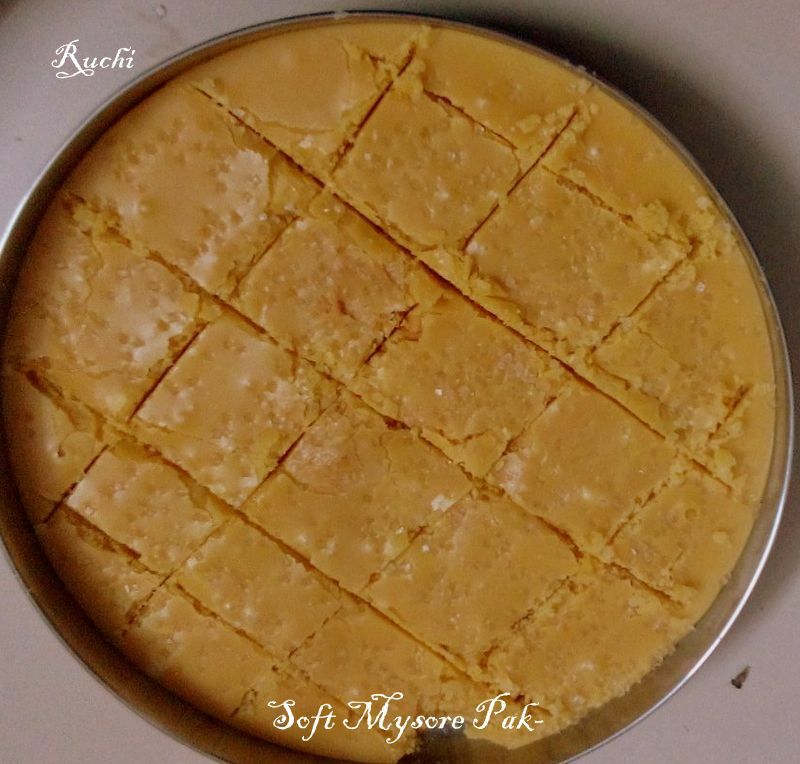 the Krishna sweet mysore pak; it just melts in mouth and tastes so heavenly! .So This time I tried soft version of Mysore pak for my son's birthday. 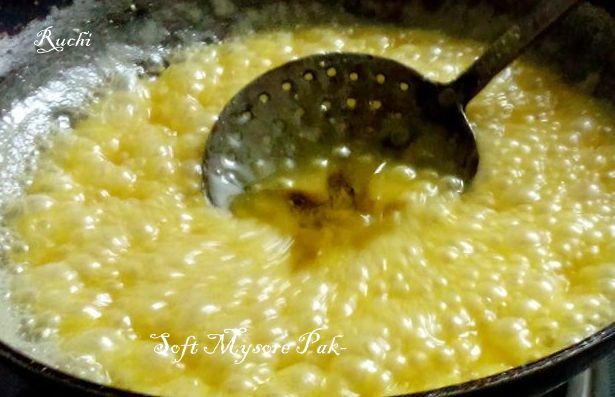 / Gram flour, sugar and ghee are the ingredients which yields this melting magic .This version is very soft same as KS as the ghee doesnt ooze out,. They looked so tempting , so soft The taste was also awesome ! melt in your mouth and they are too irresistible! 1.Sieve the besan without lumps .Then In a heavy bottomed pan on medium heat, roast the gram flour in 1/4 cup hot ghee until it begins to turn golden brown and gives a roasted aroma. 2.In the same pan; add sugar and 1/2 cup water and bring to a boil. Stir the sugar in water until it dissolves, and allow it to come to boil until you get a one string consistency – it should feel sticky between your fingers. 3.When the one string consistency of sugar is reached, add besan slowly and now keep the flame in low. Stir until besan is fully dissolved in sugar syrup and the lumps are gone almost. 4.Then add ghee little by little with medium flame until it absorbs all the ghee. Look out till the mixture leaves the sides of the wok Add more hot ghee and keep stirring until the ghee absorbs in the mixture. 5.Once the entire mass comes together and looks smooth, add the last portion of ghee and continue to stir till the whole masses rises up like froth. 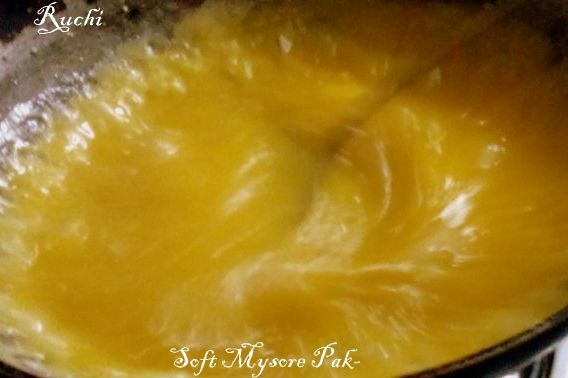 Once it comes to this consistency, remove from the heat and pour the gram flour mysore pak mixture into a greased tray. 6.Sprinkle a little of granulated sugar over the top and allow the Mysore Pak to set and cool completely until set . 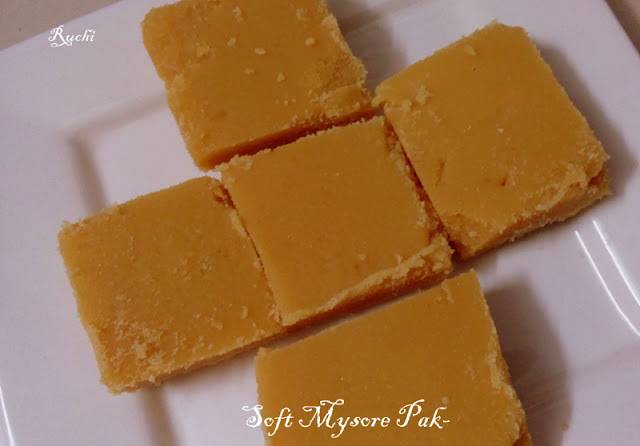 7.Cut the Mysore Pak into desired shapes.You will get very soft Mysore-Pak and certainly delicious. This is simply droolworthy. Thanks for sharing the recipe, I am definitely going to try this one.